The band's last stop in town saw members participating in the fest's huge Hail! Hail! Chuck Berry tribute. It’s easy to take Spoon for granted. Numerous bands and trends have come and gone since singer/guitarist Britt Daniel and drummer Jim Eno formed the band in Austin 25 years ago, but Spoon has remained a constant, steadily growing presence. As such, there have been no scandalous headlines about intra-band drama nor ostentatious album rollout PR campaigns — just an excellent band churning out enough great albums to be dubbed the “overall top artist” of the 2000s by review aggregator website Metacritic. That decade-defining run began in earnest with 2001’s Girls Can Tell, which showcased the modern Spoon sound through sparse arrangements of warm keyboard chords, Daniel’s trademark raspy howl, and strutting guitar often spiked with liberal amounts of tremolo. The result was a profile-raising album that exuded a detached, classy sense of cool while still packing an emotional punch. And while that full-length established the template for the band’s new sound, it was merely a starting point, says Daniel. “Ever since we put out our third record Girls Can Tell we’ve been trying to… go in a different direction with it, or at least add some tricks,” he says. 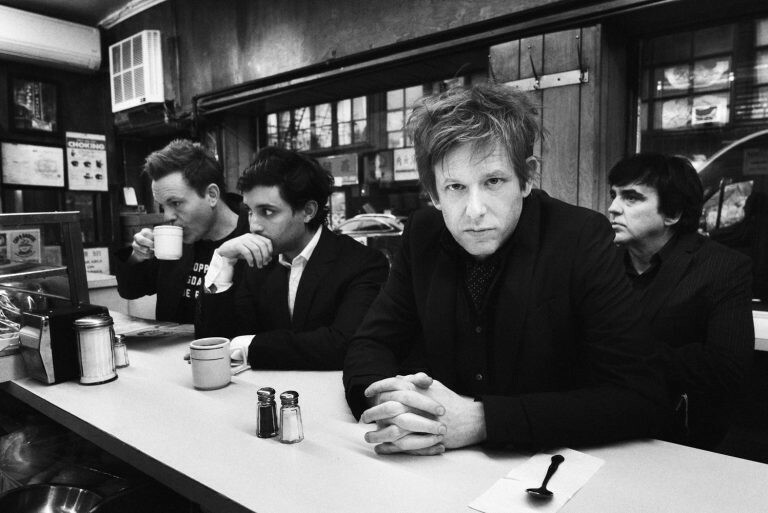 Indeed, while Spoon has carved out a sound too distinct to resemble anyone but itself, successive records added genre flirtations (the funk of “I Turn My Camera On” from 2005’s Gimme Fiction), varying styles of production (the intentional lo-fi sound found in 2010’s Transference) and the occasional left-field instrumentation (everything from vibraphone to beat-boxing to kotos have been employed). But the band's newest album, Hot Thoughts, might be the furthest departure yet. 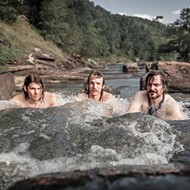 Even with as many experiments as the band has tried, it’s still a shock to hear a Spoon album end with the drums-and-saxophone centered instrumental soundscape of “Us.” Elsewhere the group almost approaches jazz in the jammy sections of the slow-burning “Pink Up.” But even on more traditionally pop numbers the LP features more synthesizers and electronic drum kits than usual, which lend themselves well to the record’s greater emphasis on danceable near-disco rhythms. Spoon got an additional push down this path from producer Dave Fridmann. Best known for his work behind the boards for the Flaming Lips, Fridmann lent his psychedelic more-is-more touch to Hot Thoughts. His influence is apparent in the blown-out drum sound of “Do I Have To Talk You Into It” and the dirtied up keyboards. Spoon had wanted Fridmann for its previous release They Want My Soul, but scheduling only let him work on half of that album. Even with that setback, the sessions were enough to kickstart a productive relationship that led to Fridmann tackling all of Hot Thoughts. Fridmann wasn’t the only outside collaborator to assist in the construction of Hot Thoughts. While Daniel still handles the majority of the songwriting on his own, the album features the largest number of co-writes from non-band members in Spoon’s history. Help came from wildly different sources. “Tear it Down” was co-written by Daniel and Laura Pergolizzi, a singer who has writing credits on songs by Christina Aguilera and Joe Walsh. Noting that mutual friends introduced the two, Daniel says the process was straightforward. “I guess you could call him my best friend,” Daniel says of Dineen, whom he met right before he started college. Part of their friendship involves Dineen sending Daniel lyrics over texts. “Often they were just like dumb sort of hip-hop style rhymes. It was mostly just done for fun, but then sometimes they started getting more and more sort of surreal and poetic and less jokey.” Impressed, Daniel encouraged his friend to send more and soon incorporated Dineen’s words into songs he had only partially finished lyrically. Finally, guest saxophonist Ted Taforo’s contributions to what became “Us” were considered important enough to earn him a songwriting credit. As invaluable as these auxiliary players were, they don’t account for Spoon’s practically spotless track record. In fact, the one area in which the band has been unreliable is their St. Louis booking. Daniel recalls playing Cicero’s in the ‘90s, but after the group played the Duck Room in 2004, it didn’t perform in St. Louis until its 2014 concert at the Pageant. Even so, Daniel made the trek here to see Chuck Berry play twice. With that LouFest appearance and the band's upcoming Pageant show, Spoon seems to have rediscovered St. Louis. Daniel at least talks the talk. 8 p.m. Wednesday, May 16. The Pageant, 6161 Delmar Boulevard. $35 to $37.50. 314-726-6161.